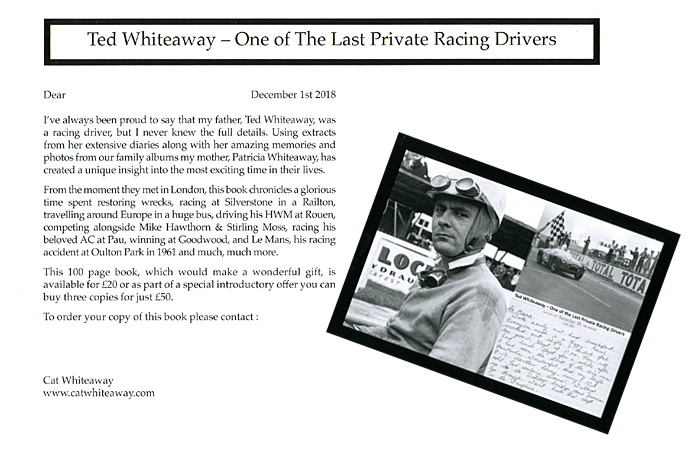 Ted Whiteaway - One of the last private racing drivers book. Homepage. This page: A diarised account of a racing driver's life in Britain during the 1950s. Ted Whiteaway - One of The Last Private Racing Drivers. Privateer motor racing in the post-war years. It would be easy to assume that all the interesting stories of motor racing drivers, in the monotone, rationed and largely gloomy years following WW2 and into the 1950s, have already been told. And with regard to the well-known drivers and racing teams of the era such as Moss, Fangio, Parnell and Hawthorn, at the wheel of cars such as the Ferraris, Maseratis, Mercedes-Benz and BRMs to name just a few, this is largely the case. Yet mixing it out on circuits and at other speed events were a plucky band of privateer racing drivers, often racing on a relative shoestring compared to the big names, yet out there sharing the same sections of tarmac and applause from the spectating crowds, keen to achieve their personal bests if not necessarily expecting to give the well-funded teams a bloodied nose. One of these lesser-documented drivers was Ted Whiteaway, born in Feltham in 1928. He just missed out on serving during WW2 but was conscripted to the army in 1946 where he learnt how to drive lorries, and cars. It wouldn't be long before he'd begin to acquire his own vehicles, these included the remains of a vintage Sunbeam that was soon followed by a 30/98 Vauxhall, both of which were resurrected and then driven enthusiastically, often to be found being given a hard time in a local gravel pit. The 30/98 would later be campaigned in club events such as rallies and trials, igniting his enthusiasm for competitive motoring. 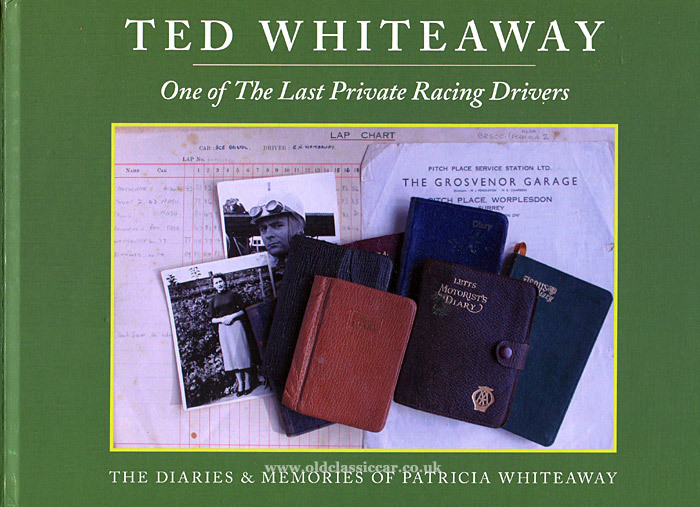 Patricia Whiteaway, as she became, with the assistance of her children decided to put this book together as a testament to the times she and Ted spent together preparing for, and attending, race meetings up and down the UK and further afield. Her diaries survive, as do a wonderful assortment of photographs that, together, shed light on the trials and tribulations of being a privateer racer in those days. In 1951 for instance the Vauxhall was put to good use in speed events, swiftly followed in 1952 by a modified Railton that continued the tradition of club racing at venues such as Silverstone, Snetterton and Brands Hatch. Single-seater racing began with a pre-war creation called the BHW (Bugatti Hassan Wilkins), which had been hidden away during the war then brought back to life, passing through the hands of Reg Parnell (as did many cars at the time). To transport this purposeful, Bugatti-powered, machine, an elderly single-decker Bedford bus was acquired and converted into a rudimentary racing car transporter, photos of which in particular appeal to me. Throughout the book are black and white photographs taken at home behind the scenes, in paddocks, and out on track, all of which together with Patricia's diary entries and notes regarding some of the motor racing personalities of the day, that are faithfully reproduced within this book's 96 pages, serve to paint the scene for this era of motor racing from a first-hand point of view, which is becoming rare to find nowadays in newly-published books on this era of motorsport. The chapter for 1954 recalls the purchase of an HWM. The first run at Goodwood that year in the new car didn't go to plan, but it wouldn't be long before Ted would be hauling the HWM in his old bus to circuits such as Snetterton, Ibsley, Silverstone, Aintree and more. The following year, overseas escapades were undertaken using a newly-purchased bus converted to the role of transporter, and once more there are wonderful photos of the ingeniously loaded workhorse complete with its cargo of car, spare parts, tools and other essential supplies to relish. I doubt that most of the photographs in this book have ever been published before, which makes it doubly enjoyable to read this work, and while the odd gremlin has made it into the photo descriptions in places, in no way does this detract from the enjoyment I had of reading this unique book. The HWM was sold in 1956, although not before another bus - this time an AEC - had been purchased. There followed a brief hiatus in racing, during which time a garage business was built up. In 1958 an AC Ace - registration SGF 333 - came onto the scene, finished in a dark metallic blue colour and already with a number of competitive outings in other people's hands under its belt. Interestingly, this car survives to this day and I'm sure its current owner would enjoy discovering the colour and b&w photos of its times with the Whiteaways. Events in the UK and overseas would again be tackled, the highlight most likely being a co-drive at that year's Le Mans 24 Hours at the wheel of the Ace (and again in 1959), by this time painted maroon. An outing at Clermont Ferrand in the three-hour race then followed. At the dawn of the 1960s Ted's attention had already turned to Formula Junior, and the designs and subsequent build of his own car - called the Condor - were in the advanced stages. In '61 a final outing in the Ace at Goodwood saw the car elbowed by another car into the chicane wall, leading onto the main straight. The book describes that the Ace changed hands a couple of times and was subsequently written-off, although clearly not to a state entirely beyond recall, as the survival of the car to this day thanks to a comprehensive restoration demonstrates. While racing, Ted and Patricia maintained a number of garage businesses although by the mid-1960s, with family life and other interests taking over, they had been sold and racing had ceased, replaced by life on a farm. The final section of the book focuses on the Condor, its development, and discusses the history of the known cars, then and now, which will no doubt be of interest to followers of historic Formula Junior racing today. I can recommend this book, which is being published in limited numbers only, absolutely to anyone with an interest in post-war privateer motor racing. The fact that this has been put together, not by a seasoned author working from other people's notes, backed by a grand-scale publishing house, but is self-published by a family who lived and breathed a life of racing and the highs and lows that inevitably surrounded this demanding sport, makes it all the more special in my eyes.